This recipe is a variation on a recipe from my friend Sarah Leah Chase, who wrote one of my favorite cookbooks, Nantucket Open-House Cookbook. The cassis makes the plums taste more "plum-y" without making its own statement. Prune plums are only available for a few weeks in September, but regular plums are also good in summer when they're in season. 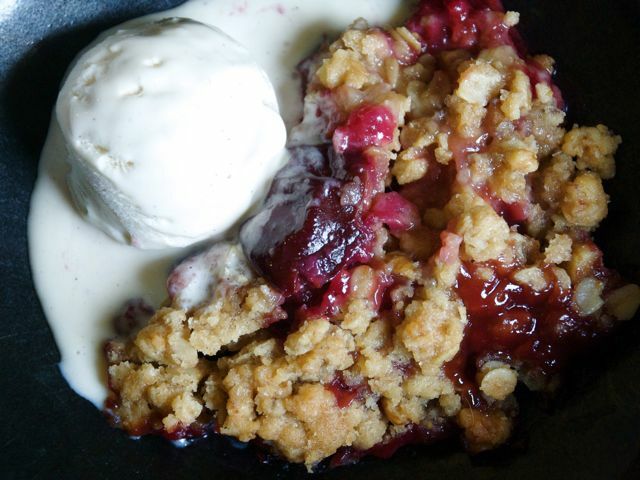 Make the filling: In a large bowl, combine the plums, brown sugar, flour, and cassis. Pour the mixture into a 12-by-8-inch shallow baking dish. Make the topping: Combine the flour, granulated sugar, brown sugar, salt, oats, walnuts, and butter in the bowl of an electric mixer fitted with the paddle attachment. Mix on low speed until the mixture is crumbly and the butter is the size of peas. Scatter evenly over the plum mixture. Bake the crunch: Bake for 40 to 45 minutes, until the plums are bubbling and the top is browned. Serve warm or at room temperature, with ice cream. Cassis is a liqueur made from blackcurrants. A splash is delicious in white wine to make a kir or in Champagne for a kir royale. Culinate editor's notes: You can swap the plums for any other fresh or frozen stone fruit, such as peaches. Because almonds are themselves a stone fruit, they pair well with this dessert's fruit flavors. Use them in place of the walnuts, if you like.